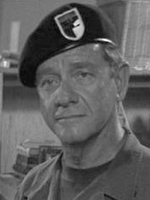 Richard Crenna began his career in radio and has had several movie roles. Richard Crenna starred in The Sand Pebbles and the first three Rambo films. Crenna was a favorite of mine. From the awkward teenager in the radio "Our Miss Brooks" with Eve Arden in the 1950's--another example of the pure working actor. CBSRMT probably a trip down memory lane. Probably laughed that he'd be remembered from of Sylvester Stallone movie. Richard Donald Crenna (November 30, 1926 – January 17, 2003) was an American motion picture, television, and radio actor and occasional television director. He starred in such motion pictures as The Sand Pebbles, Wait Until Dark, Un Flic, Body Heat, the first three Rambo movies, Hot Shots! Part Deux,the remake of Sabrina, and The Flamingo Kid. Crenna played "Walter Denton" in the CBS radio network and CBS-TV network series Our Miss Brooks and "Luke McCoy" in ABC's TV comedy series The Real McCoys, (1957–63), which moved to CBS-TV in September 1962. He served in the US Army as a radioman in WWII where he saw combat in the European Theater at the Battle of the Bulge. Crenna also served in the Pacific Theater decoding Japanese intercepts. Richard Crenna got his acting start on radio. In 1937, he had gained his first role that of "the kid who did everything wrong" on Boy Scout Jamboree, a show on which he continued to appear occasionally in numerous roles until 1948. In the following year, he started playing Walter "Bronco" Thompson on The Great Gildersleeve, and played it until the show's end in 1957. He appeared as a delivery boy in My Favorite Husband episode "Liz Cooks Dinner for 12", was Oogie Pringle on A Date With Judy episode "The Competitive Diet" and several other episodes from the show and as a teenager on The George Burns and Gracie Allen Show episode "Watching the Neighbor's Daughter". On Television he appeared in some of the following shows Our Miss Brooks, I love Lucy, Frointer, Father Knows Best, Cheyenne, The Real McCoys, Slattery's People, Catlow, Breakheart Pass, and The Man Called Noon. In the 1960s, Richard Crenna directed many of the episodes of the Andy Griffith Show.